Epigenetics is a fascinating field. I first heard about it through geneticist Bruce Lipton. At the time it was not an accepted branch of biology. We’re all born with a fixed set of DNA that comes roughly half from our mothers genome and half from our fathers. If you and one of your parents get a DNA test, you’ll know which of them gave you what. Each of our siblings also has a similar proportion, but each has a different mix. Essentially, our genes are sequences of chemical combinations that are a blueprint to create specific proteins used as the building blocks of our body. However, the genes also have a protein cover that other chemicals open and close in various ways. When sections are exposed, a protein recipe is revealed for replication. When sections 17-19 are exposed, it produces a different protein than when just 17-18 are out. This distinction is key for understanding epigenetics, the study of external control of DNA expression. It also means our genes are not determinism. Rather, DNA is a blueprint for replicating proteins, but it doesn’t control their expression. It is not our destiny. Identical twins with matching DNA can have different life and health outcomes. What you do with what you have is more important than what you have. Bruce talked about the influence of the mothers environment during pregnancy. Is she stressed and in danger? Or is she relaxed and listening to classical music? For the baby to survive in the world to come, it will respond to the levels of stress by developing more muscles or more forebrain. Ayurveda also talks of the importance of nutrition during pregnancy. In the TED talk below by epigeneticist Moshe Szyf, he speaks of how early life experiences can program gene expression too. In other words, the process continues after birth. Food availability, threats, care, social status, and more can program our response. If food is uncertain, we’re programmed to binge or store it as fat. 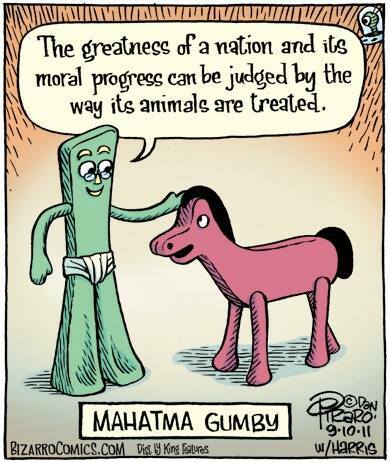 Yet this adaptation may not serve us well when food is very available. Our programs becomes a maladaption that affects our quality of life and may also affect gene expression. Scientists tested if they could deprogram the automatic adaption response. In the example case, could they break cocaine addiction? In animal research, they could break the pattern with a single treatment. While DNA is an old blueprint, gene expression is flexible and adaptive. Gradually, we’re learning how to correct programmed behaviours that are not in our best interest. It’s fascinating to consider. My father was a forest scientist, professor, and conservationist with an expertise in tree disease. While I didn’t follow in his footsteps, I’ve maintained a love of the forest. Forest science has evolved considerably in recent years in ways that many people are unaware of. The Hidden Life of Trees is the best-selling book by forester Peter Wohlleben. Here, the author, Dr. Suzanne Simard, and Dr Teresa Smhayetsk talk about how trees support each other, including other species, but know friends and family. Dr. Suzanne Simard is a western Canadian forest scientist who explains in a TED talk how trees communicate. This includes an underground network for transporting signals and sharing nutrients. And here the author Wohlleben is interviewed, also mentioning the “wood wide web” and wheat “talking” at about 220 Hz. And if you’ve not seen it, The Man Who Planted Trees. An old favorite. For some years, I’ve been watching the work of self-taught physicist Nassim Haramein. He’s given many seminars on his ideas and released video of them, including the 6-hour Beyond the Event Horizon. Many people have studied how to explain his ideas and more recently they’ve launched an on-line “academy” to take it further. He’s also shown up in various works like the film Thrive. Some of his ideas have been wildly speculative, like the grave of Jesus or the meaning of a comet. But the unfolding physics has been quite fascinating. As with Einstein and Buckminster Fuller, the physics is driven by his experiences. While my physics isn’t strong enough to test his work, he has been working with several traditional physicists and has had his work published – peer-review is the key screening for science. His model proposes a solution for Unified Field Theory but it comes out of left field, dropping the standard model of 4 forces into 2 and placing a black hole inside every proton. Key also is reintroducing spin into Einstein’s Field equations (also related to that black hole) and a universal scaling law. The results of his formulas are more accurate than the Standard model. Meanwhile, he’s been working on a film to bring the ideas to a larger audience. In the summer of 2014, I saw clips at the Vancouver production studio of the in-progress work. Some of the film was also shot in Vancouver and Whistler. The project ended up being the most successful Indigogo fund-raising campaign and first into a new Vimeo distribution product. The film is called The Connected Universe and has now been released. It can be watched on-line for about $7. The trailer. While the film talks about his work and how it developed, Nassim stays very general on science, focusing more on the broader ideas and the potential impact they could have on our world-view. He talks about how we’ve been looking at matter to define space but it’s actually space that defines matter. At about the halfway point, he explores how important an information feedback mechanism is for the universe. This is the source of the self-organizing systems that surround us. Without it, form would never have arisen in the first place let alone evolved over billions of years. However, he goes on to suggest that the feedback mechanism is what makes space conscious and able to learn about itself. This is a subtle form of materialism. I would suggest space arises in self-referral consciousness, so consciousness defines space. Awareness automatically creates a feedback mechanism by being aware of what arises in space (itself). In other words, consciousness provides a built-in feedback mechanism that is present in space and in matter. As we mature as people, we notice progressively more subtle layers of our own nature. That awareness brings a more alert feedback mechanism which is self-enhancing. But I fully agree that the universe is one massive feedback mechanism. The film is full of gorgeous graphics although much of it is artist expression rather than an accurate illustration of the dynamics. At several points, they come back to the importance of our attention. The film does touch on the importance of spin, forces, and the universality of black holes as I mentioned prior. But I was disappointed they skimmed over it and didn’t display a model of the dual torus and the inner dynamics that create the 2 fundamental forces – attractive and repulsive. It’s also absent any test results. By comparison, here’s a TEDx talk he did with a little more of the science. Primarily, the film talks about the broader ideas and possible consequences of vacuum energy devices and a new world-view of being intimately connected. We could say a film of vision rather than application. I’ve written several articles on this blog on the CHIP program and the many health benefits of shifting to a more plant-based diet – including reduced cancer risks. Recently, the World Health Organization announced that processed meats are carcinogenic and red meat probably also is. This is based on hundreds of studies. A friend recommended the film Cowspiracy, a surprising documentary about the meat industry. Not only is excess meat a health issue but it’s also the number one cause of global warming. Simply because of volume, cows and their processing produce well over twice the greenhouses gases than all forms of transportation. Really? “Livestock’s Long Shadow: Environmental Issues and Options.” 2006. US Department of Agriculture Economic Research Service, 2013. 54% is for growing feed crops. Conservatively, 2,500 gallons of water are needed to produce 1 pound of beef. Eating a single hamburger will negate any individual efforts you can make to conserve water. “We are currently growing enough food to feed 10 billion people.” But half of it goes to feed animals, even in countries with starving children. Meat production is the largest cause of deforestation, water consumption, ocean pollution, and desertification. A third of the planet is now desert. And yet the film-maker found that most environmental organizations refused to talk about it. His primary funder suddenly backed out over the “controversy”. Turns out it’s illegal in the US to speak against the meat production industry. There is now an “Animal Enterprise Terrorism Act”. In other words, speaking about this in the US can be considered a terrorist act. In South America, people are shot for protesting against agribusiness. Yet – on a given land area, we can produce 15x the protein with plants rather than animals. “A person who follows a vegan diet produces the equivalent of 50% less carbon dioxide, uses 1/11th oil, 1/13th water, and 1/18th land compared to a meat-lover.” Just with diet. I’ve been blessed with a robust constitution from a “successful” gene pool. But this has meant it was easy to be lazy about taking care of myself. Although I’ve been “reasonable”, my lifestyle choices have slowly caught up with me. I’ve gradually become more sedentary with a little too much fill the bucket eating. I’ve tried several diets that made a lot of difference. Loved the Reboot program, for example, but didn’t make the long term changes to keep it off. Once I finished the juice fast, things gradually went back to the old habits. And because basic lifestyle patterns were not changing, things just slowly got worse. It finally started to catch up with me. The basic problem is, our modern western “healthy” diet is very simply not. The major diseases of western countries are diseases of abundance and excess, ironically. But because it’s common, we see it as normal. The western medical system is allopathic, designed to treat things like infections and broken bones. But MD’s are not typically well-trained in lifestyle and nutrition, nor are they set up to guide a patient through such changes. When people come to them with chronic issues related to lifestyle, they can offer some advice to loose weight or relax, then pills to treat the symptoms. But none of this addresses the cause. As a result, in most cases the patient does nothing or doesn’t find anything effective long term and fails. The chronic conditions get worse, the prescriptions climb, and people keep returning to their doctor for help. Yet they do little to help themselves, often because they don’t know how. We need to change our thinking and recognize we have to take responsibility for our health. Often, we take better care of our cars than our bodies. It’s estimated that 70% of doctor visits are related to lifestyle issues they’re not set up to address. The major health issues of our time are dominated by lifestyle-related ailments like heart disease, diabetes, and cancer, developed over many years of bad habits. Why is our diet so bad? In the 50’s, researchers determined that our western diet was too high in fat. They introduced lower fat recommendations. Not only did this lead to the low-fat craze but it also lead to far more processing of foods. Taking out the fat also took out the flavour. So they compensated with things like sugar and salt, massively increasing our intake. Food research sought the “bliss point” of sweetness to be appealing, even in baby food. They also discovered that sugar and caffeine could make a food addictive. Many foods became increasingly unnatural designer foods, made to appeal to our base tendencies. The long term result – a massive increase in obesity. When someone begins to realize how their lifestyle is affecting their health and quality of life, they may look to make changes. Most visible is gyms and diets. If you’re lucky, you’ll find the right resources and motivation to make the changes needed before there’s a health crisis. But often, people end up trying a long list of fad diets and programs that have more of a yo-yo effect than long term benefit. What many need is some support and filling in some of the gaps in our self-care skills. We need a dose of preventative medicine. In my own case, I needed lifestyle changes, but an approach that was straightforward and real. This is when I ran into the CHIP program, recommended at the end of a health article. CHIP stands for Complete Health Improvement Program. It began some years ago as a heart-health program similar to Healthy Heart. The second is mainly for people already with a serious health issue, often offered at hospitals and the Y. CHIP broadened the approach because the principles are true of many common chronic health issues, not just the heart. While Reboot had paid support programs, this was in-person groups working together. CHIP is also one of the best researched programs available and arose out of a history of prior research. Large, long term studies have shown that the greater the amount of animal fats in the diet, the higher the risks of developing chronic illness. This science is well understood but not widely known. I’ll write more on this shortly. What has really impressed me about such a mainstream program is that none of the advice I’ve objected to. I’ve studied traditional health systems like Ayurveda and the advice aligns very well with it. It is really good advice: whole, plant-based, unprocessed foods, variety, and plenty of exercise. The principles are very straightforward but do ask for real change. And not temporary change either. This is not a diet to try but a change in lifestyle. Not a temporary fix but a long-term shift. There is no calorie counting and no starving. You can eat lots and loose weight, if you choose the right whole foods. Without the addictive foods in your diet like sugar and caffeine, you won’t get the cravings that ruin many a diet. But also, diets without exercise are not a solution. Your body is not designed to be a slug. We’re built to be active. Yet lots of exercise without changing what you put in your mouth isn’t a solution either. This is about improving your whole quality of life long term. When you get into the swing of exercise you like, it feels really good. And this doesn’t take long. If you’d like a metric, under 5,000 steps a day is sedentary. That includes most of us. 10,000 steps brings you an “Active” status. Unforced, it also brings the yummy experience of stepping into “the zone”. The program comes with a pedometer. Worn throughout the day, it will easily track how you’re doing. CHIP is 18 classes, packed with tips and research to back up the recommendations. A cookbook too. For me, I’ve lost weight, waist size, and feel quite a lot healthier than I have in awhile. And we’re only at class 4. Fun stuff like dancing isn’t exhausting now. I use the car much less. My food bill has dropped markedly. And many are telling me how great I look. While I’m still in the keener phase, I can heartily recommend the program. It’s taught all over North America. Modern evidence of natural “coincidences” that the Universe was designed for complex, intelligent life. The key mechanisms and properties that allow life as we know it. Of course having a privilege doesn’t make you special, it gives you a responsibility to do something useful with the gifts you’ve been given. And to have fun. Douglas Coupland, the GenX author and artist recently had a “wildly popular” art show at Vancouver’s premier gallery, the VAG. It’s full of cultural memes, explored with some humour. 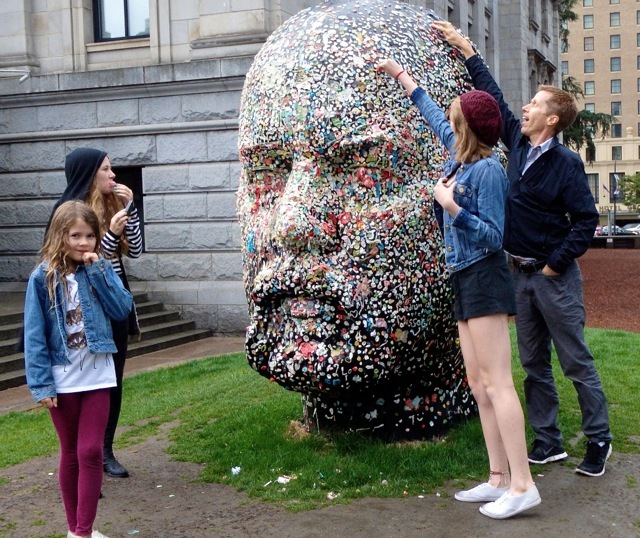 This included a giant cast head of himself, onto which the public was invited to stick pieces of gum. Google has memorialized it in their “Collections” and sent in a Street View team… On this site, you can browse some sample images to the right, click Exhibits for more of an explanatory slide show or, on the left, click Street View and browse the galleries themselves. A virtual gallery walk. Keep an eye on the left map to help with directions. I can’t say the directional controls were as intuitive as a usual Street View, but it’s an interesting application of it. The top menu bar also allows you to browse over 600 other galleries collections, plus some “User Galleries”, apparently assemblies of artwork by users. I’ve written before about how microloans can allow the average person to easily help someone fund a project. I’ve also mentioned the powerful book The International Bank of Bob, on one guys experience with Kiva. My own original loan through Kiva has now been repaid and reloaned 17 times in 13 different countries – to students, grocers, suppliers, and makers; to single mom’s, young families, groups, and more. Making a loan takes just a few minutes, unless you choose to browse the many opportunities. Kiva has recently released a video on how simple the process is. How to turn a dozen toonies* into real value. *a “toonie” is a nickname for a Canadian $2 coin. The $1 coin has a Loon on the back, hence a “loonie”. The nickname of the $2 coin followed suit although personally I liked “doubloon” better. The understanding of the place our galaxy holds in the universe has been evolving. Laniakea means “immeasurable heaven” in Hawaiian.